Where are the majority of lighthouses located in the United States? What region? It’s surprising to many people that the majority of American lighthouses were built along the shores of the Great Lakes. Today’s blog post explores the lakes, commerce, lake lighthouse design, a few iconic structures, and leaves you with a story to remember. They are freshwater lakes, but for those crossing or navigating them, the Great Lakes seem more like oceans. 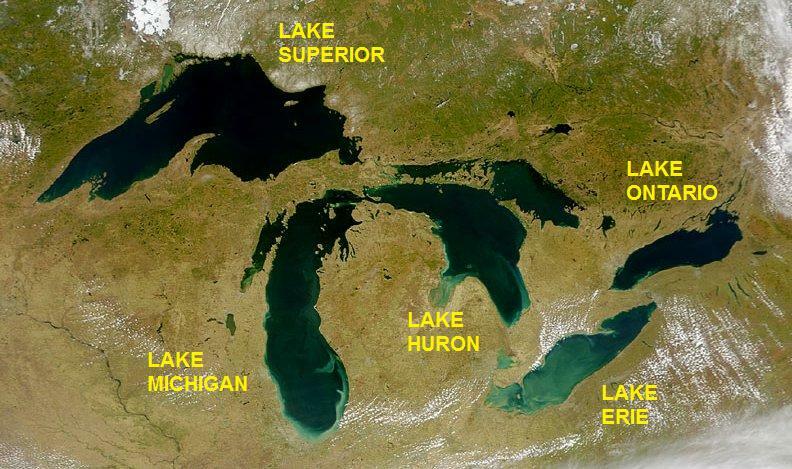 The Great Lakes are Superior, Michigan, Huron, Erie, and Ontario. The lake shorelines vary from sandy “beaches” and shoals to high cliffs. Weather, winter ice, and submerged dangers (like logs, shoals, rocks, etc.) presented (and still present) challenges to ships on the lakes. During the early 19th, the United States was expanding and developing economically. Land transportation was a problem, but travel or transportation by water was comparatively simple. The Great Lakes, surrounding rivers, and later man-made canals created a network for moving produce, goods, and people across the northeastern part of the country. As immigration increased in the 1830’s and 1840’s, many new arrivals traveled west by water and settled along the shores of the Great Lakes, eventually building the great cities. Commerce routes linked the cities and connected them into the trade systems, allowing a strong economy to develop. The shipping on the Great Lakes was in important part of America’s develop, and even in the 21st Century, they continue to play an important transportation role, moving millions of tons of bulk cargo. 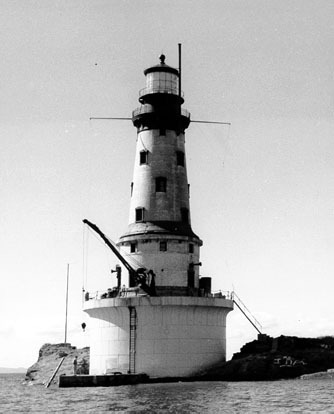 The commerce and transportation on the lakes prompted the lighthouse construction. After-all, nobody is happy when is a ship is lost, run aground, or misses the port. Since the lake shorelines vary so greatly in their geographical features, there isn’t just one particular type of lighthouse constructed along the great lakes. As in all the other regions, need dictated the construction and style. Some lake lighthouses were small and houses small lenses, mark port entrances or other lesser navigational points. Others contained the largest lenses and sent warning and navigational beacons far out over the water. 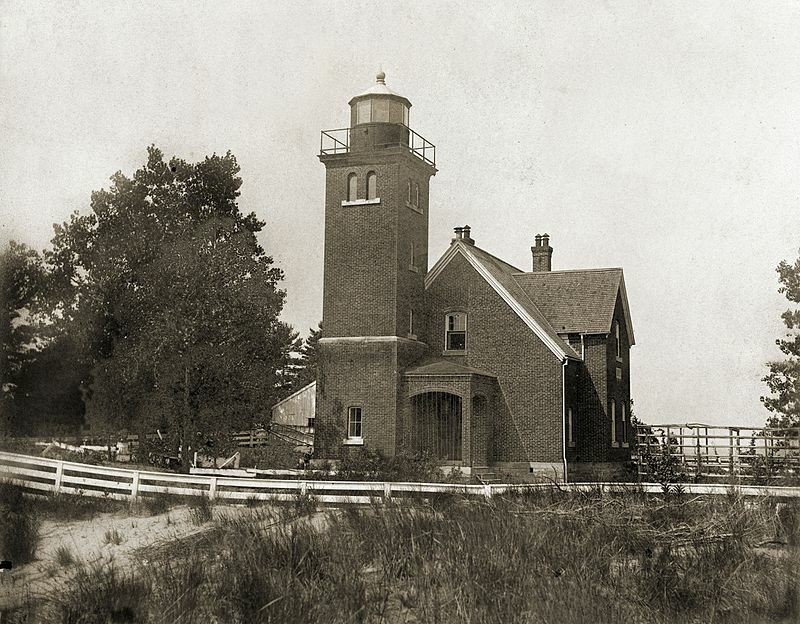 The earliest lighthouse built on the Great Lakes was constructed in 1819. 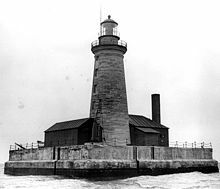 In the next five decades more lighthouses were constructed, but it wasn’t until after the Civil War (1861-1865) that the plethora of lighthouses were built along these shores. Presque Isle area in Pennsylvania, along Lake Erie was the first lighthouse built on the Great Lakes. 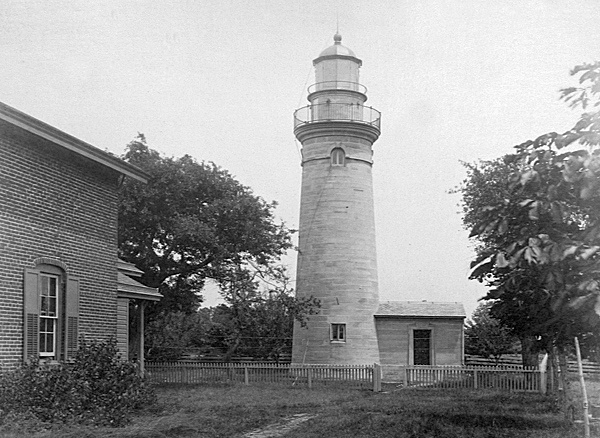 Constructed in 1819 – shortly after the War of 1812 – the on-shore lighthouse was rebuilt in 1867 and a couple years later renamed Lake Erie Light Station. Another lighthouse was built on the opposite side of Presque Island and is know as Presque Isle Lighthouse, making two lighthouses in close proximity to each other as guiding lights. Lake Erie Lighthouse is preserved and open for tour. Presque Isle Lighthouse is still operational and is open for tours on select days. Located at the northern end of Lake Huron, Spectacle Reef Light was an engineering feat, built to warn mariners of the dangerous reef. Built in 1867, the estimated cost for construction came in at $300,000. Engineers picked a spot on the reef that was only eleven feet below the water’s surface and made a crib-dam on shore which was then place and secured on the reef, the water pumped out, and then the dam and stone layers for construction were bolted into the rock. The solid stone lighthouse has withstood storms and ice which once piled thirty feet around the five story structure. Spectacle Reef Light is still in use. Tours are not allowed, but the lighthouse can been seen from private boat or plane while touring the Mackinac Straits. 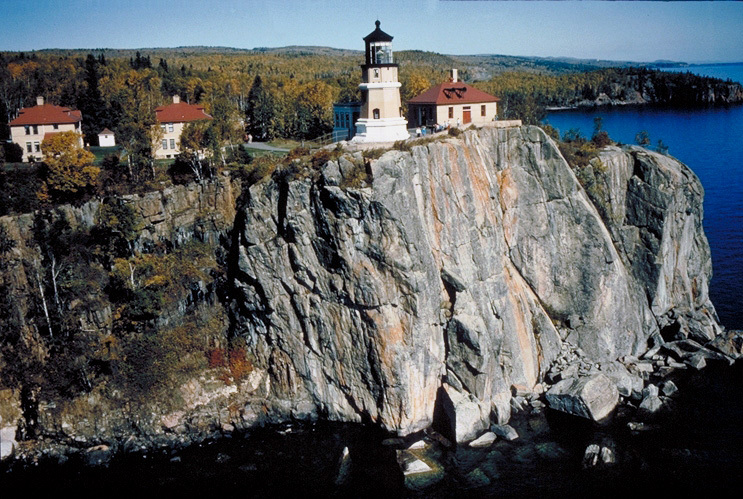 A famously photographed lighthouse from the Great Lakes region is Split Rock Lighthouse. First lit in 1910, the lighthouse is along Lake Superior on the Minnesota shore. It’s a steel frame and brick building fastened to the cliffs. Now preserved by a state park and the Minnesota Historical Society, the lighthouse is open for tours most months of the year. 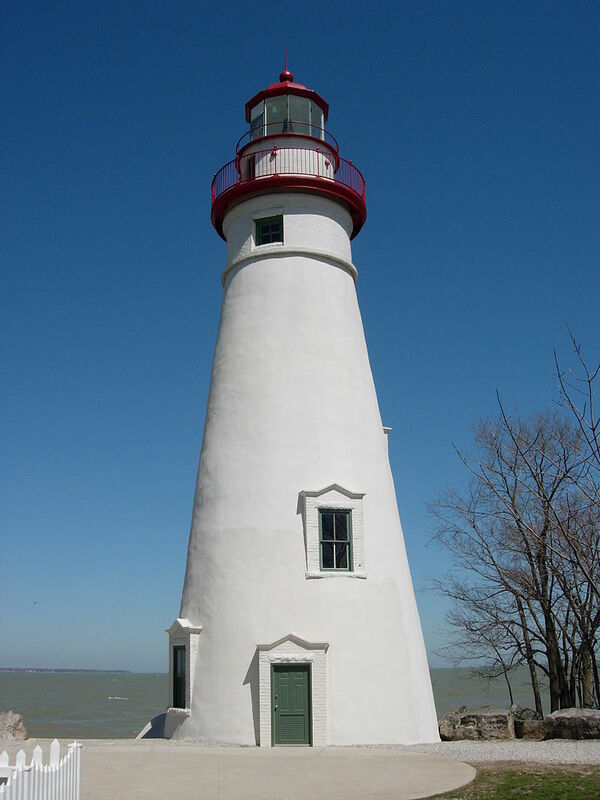 The first keeper at Marblehead Lighthouse on the Ohio shore of Lake Erie was a Revolutionary War veteran. The lighthouse was constructed in 1821 and Mr. Wolcott and his family moved into the keeper’s quarters. At that time, thirteen whale oil lamps and reflectors provided the light. Wolcott faithfully kept the light, noted the passing ships, watched the weather, and sent out rescue parties for eleven years. After her husband’s death, Rachel Wolcott took over the lightkeeping duties. During the Civil War years, this lighthouse’s beacon was visible to the guards and Confederate prisoners at Johnson’s Island prison. And the lighthouse silently witnessed, Southern partisans capture a ship and attempt to free the prisoners. Important life-saving expeditions were launched from the light station in later years, and in 1875 keepers stationed here were the first civilians to receive the Congress’s Lifesaving Medals for their heroism. Marblehead Lighthouse is preserved and open for tours at certain times of the year.